If you’re struggling to maintain a journal, we recommend ditching the fancy journal apps 5 Quick & Simple Ways To Write Your Life Logs With These Minimalist Online Journals 5 Quick & Simple Ways To Write Your Life Logs With These Minimalist Online Journals Read More . Instead, turn a text file on Windows into a journal, complete with automatic timestamps. Open the default Notepad application on your Windows PC and click on File > New. In the new document that gets created, type in .LOG, and hit Enter. Click on File > Save As and save the document as a text (.TXT) file, say journal.txt. Next, close the document and reopen it — don’t skip this step. You should now see the current date and time appended in the file, and you can add your journal entry on the next line. Every time you open the file, a new timestamp appears automatically. It’s perfect for adding a few lines about your day or whatever is on your mind. Add a desktop shortcut to the text file, so that you can add journal entries quickly, before you talk yourself out of it. You could even turn the file into a gratitude journal How To Be Happy In Five Minutes A Day How To Be Happy In Five Minutes A Day Psychology has started to shed light on how to make yourself happier. New products and apps are using these findings. One of these promises to make you happier in just five minutes a day. Read More . 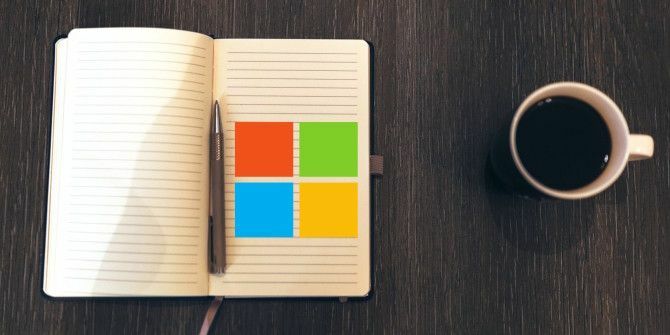 This Notepad feature has been around since the days of Win 98, and works right up to Windows 10. Which app do you use for journaling? How do you stay consistent with journal entries How To Keep Writing Daily Journal Or Diary Entries For A Year How To Keep Writing Daily Journal Or Diary Entries For A Year The start of a new year is a great time to begin keeping a journal or diary, but the challenge lies in keeping up your new daily journal writing habit. Read More ? Share your diary-keeping secrets with us in the comments! Thank you very much! I'm rubbish with AppleScript, but I'll look at WordService. I agree, Akshata - simplicity is best every time. It also means that you're not bound by one format and so in danger of losing information (or even everything) by tying yourself into a program which later becomes obsolete and from which there's no possible or easy transfer out of data. I use AllMyNotes, which is my database for everything. Like Peter Buyze, I dropped Evernote (when it corrupted some of my data during an upgrade), and decided to come out of the Cloud for the sake of integrity of data as well as privacy. AllMyNotes has a better search facility than Evernote, so I can search my entire journal for anything, even just a phrase or a name, and find the place at high speed. There is a facility for date stamping, and it's completely customisable - but I can also add pictures, tables, lists (numbered or bulleted), hyperlinks - you name it. And I can just have one long continuous journal, or I can split it into as many separate parts as I want; it doesn't matter because of AllMyNotes's awesome search facility. Best of all, there's absolutely no problem in exporting my data, so my journal is future-proofed. Thanks for sharing those shortcuts, salkis. Maybe there's something similar for Notepad++ as well. Silly question: is there a way to enable automatic time/date stamping on TextEdit for OS X? I haven't found it in Preferences. Hey Perry, please see my response to reader dwream's question below. Thanks, Akshata, for this very useful tip. When I’m on my Windows system I expect to use it. But I’m in the process of migrating to the Apple world. Do you know of a similar trick I can use on my MacBook Air? Glad you found it useful, dwream. On OS X, if you're familiar with AppleScript, you could create one to input the timestamp automatically and add it to the Services menu. OR you could use WordService — a free app that allows you to manipulate text (Adding a time stamp is one of the features available in it). Thanks again. That 2nd suggestion (WordService) looks like the best route for me! It works very well for adding date - either long or short, as selected on the services menu. I haven't had success with all of the key combination shortcuts yet and it will take a while to learn about the other features. But it will be a useful program in my editing "toolkit". Thanks for introducing me to it! I have used Notebook as a journal for years, but instead of doing the .LOG thing, I find it just as easy to press F5 at the beginning of my entry. That's a cool tip. Thanks for pointing it out! Thanks for sharing Akshata. This is so elegant in its simplicity. It is good for writing down some thoughts, but nothing else because you cannot attach or insert anything to Notepad. I use OneNote (dropped Evernote) and have a template, an empty copy of which I insert every day. So every day there is a new page added. On the template I add some standard information, as well as my thoughts (i.e. non-standard), photos (if I took any) and any other info relevant to the day. Very nice feature I was unaware of, thanks for sharing.